The day before New Years Eve, Michele and I and a group of friends went to Bern’s Steak House in Tampa. We had a great time and drank some wonderful wines. 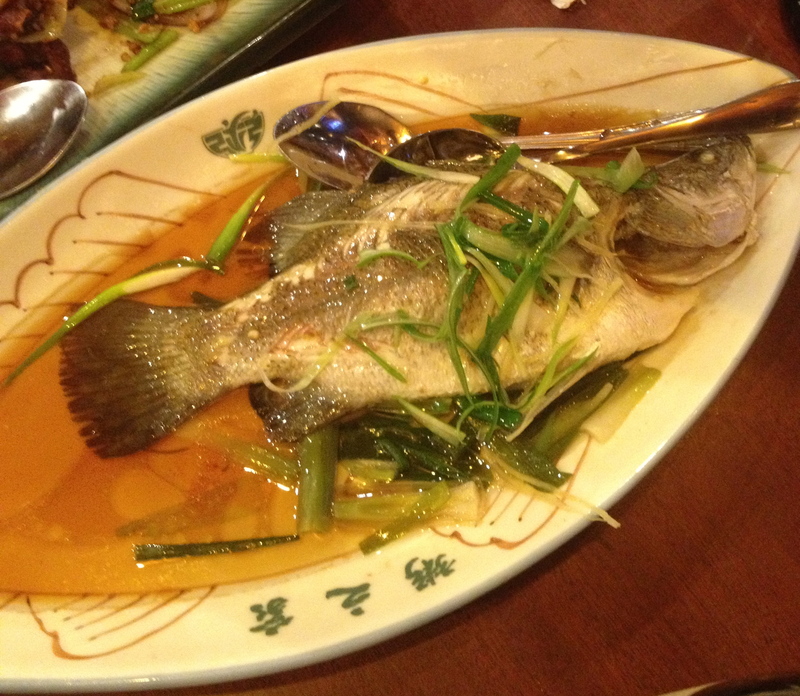 The New Year came again in February — the Chinese New Year–the year of the snake. This time we did not go very far to celebrate. 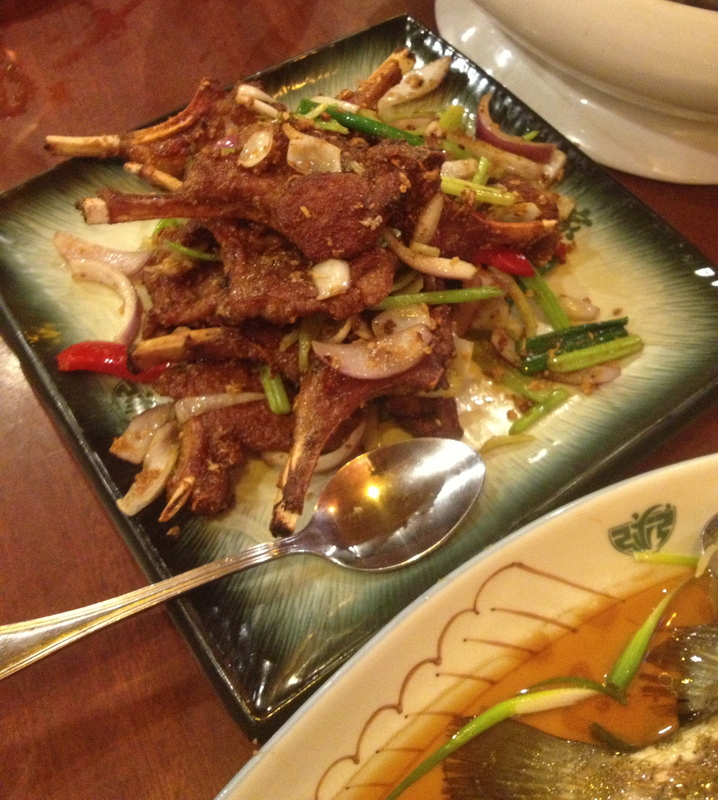 We went to Congee Village on Allen Street in NYC for their special Chinese New Year menu. The corkage fee is only $10 per bottle so we brought our own wines. 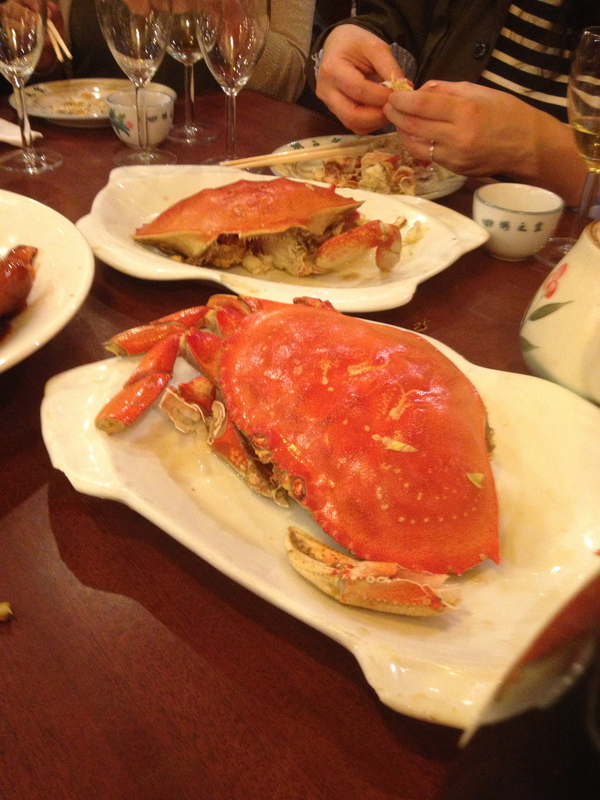 The food was very good and plentiful. 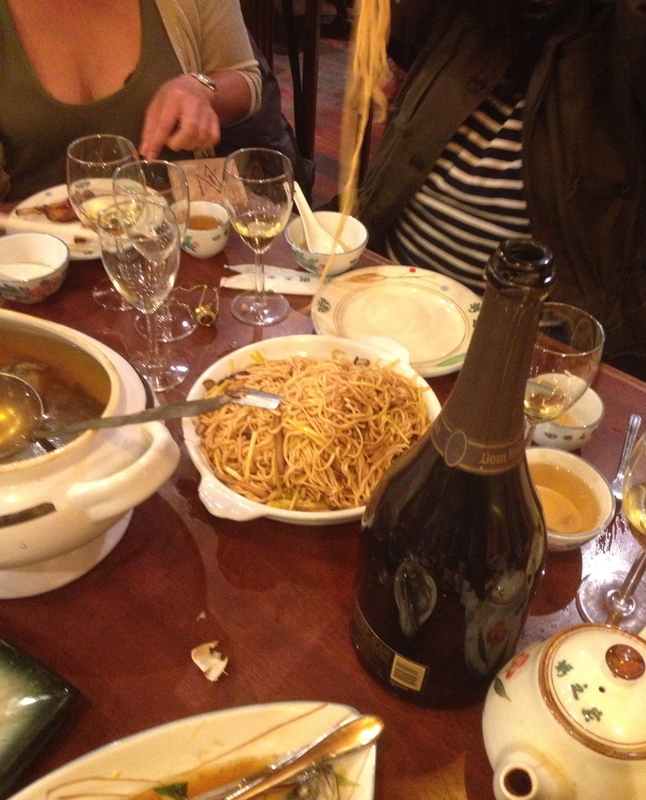 To begin our celebration of the year of the snake we started with Champagne. 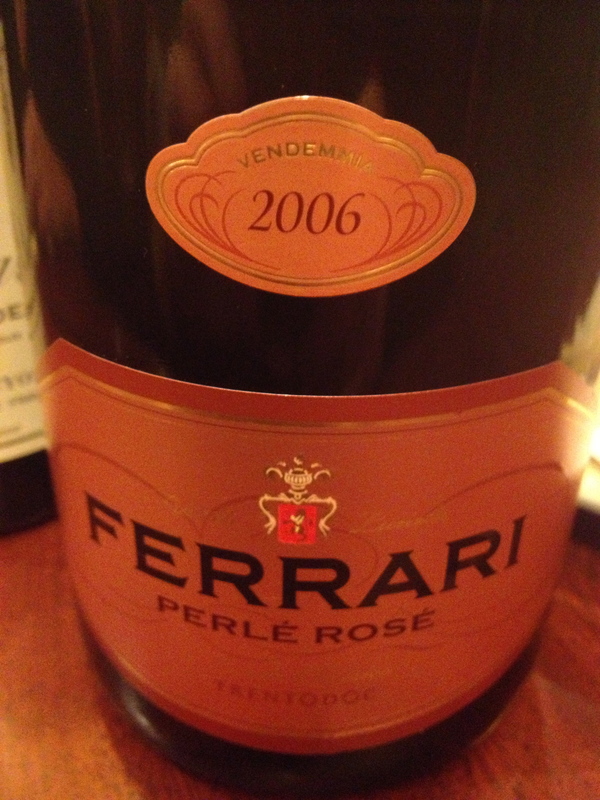 Ferrari Perlé Rosé 2006 Trento DOC Method Classico made from 80% Pinot Noir and 20% Chardonnay. This is a vintage Rosé from the Lunelli family, owners of Ferrari, estate vineyards. The grapes are harvested by hand at the end of September on the hills surrounding Trento, with either southeastern or southwestern exposure between 1000 and 2000 feet above sea level. The wine is aged 5 years on selected yeasts. It is an elegant and complex Rosé with ripe red berry aromas and flavors with hints of raspberry and a touch of almond. It has a long finish and pleasing aftertaste. I believe that Ferrari makes some of the best Method Classico wine in Italy. 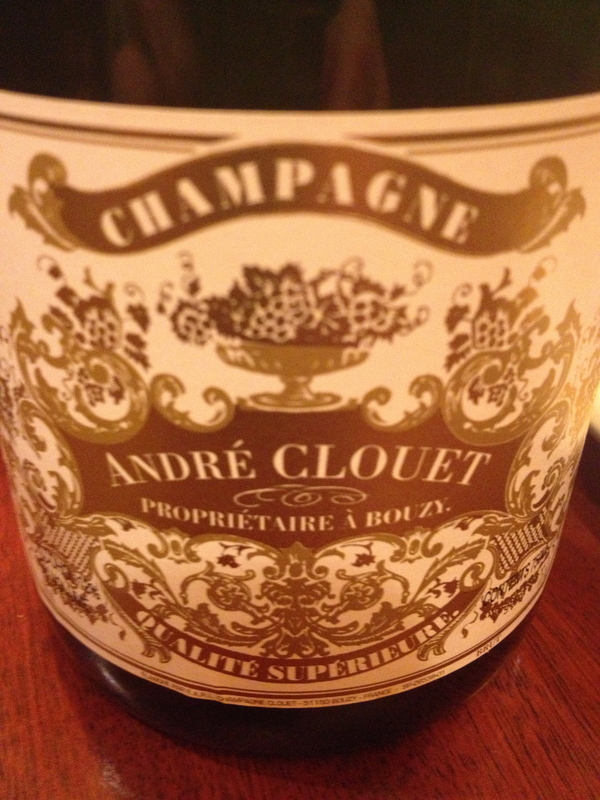 Grande Réserve Brut Bouzy André Clouet 100% Grand Cru estate-bottled Bouzy pinot noir aged six years on yeast; with strawberry, wheat kernel, and stone flavors along with a pleasing touch of cream in the mid palate and finish. The Clout family owns 8 hectares of vines in preferred mid-slope vineyards in Grand Crus Bouzy and Ambonnay, and has excelled as a pinot noir specialist even within Bouzy, an appellation specifically celebrated for the quality of its pinot noir. The wines are cellared under the family’s 17th century village house – built by an ancestor who acted as printer to Louis XV’s royal court at Versailles. Respect for terroir is evident in these traditionally crafted wines. The labels are attractively old-fashioned in design. 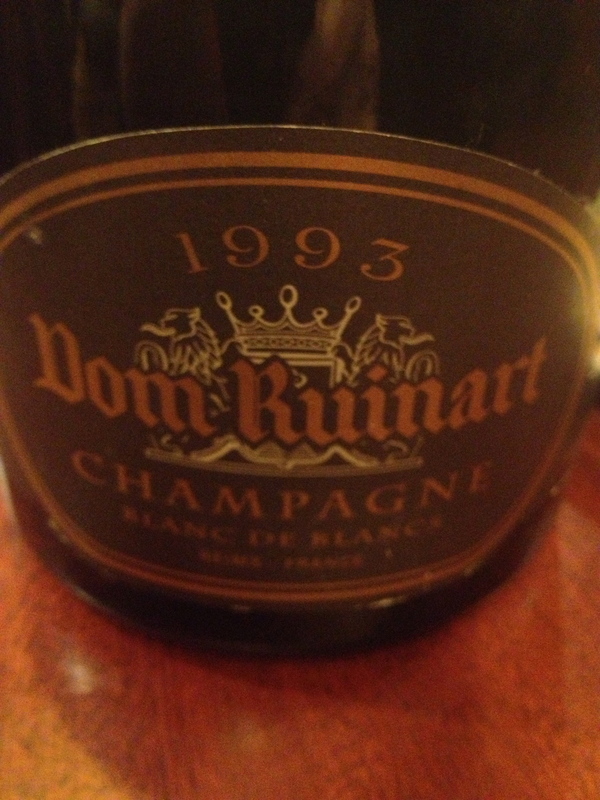 Champagne Dom Ruinart Blanc de Blancs1993 in Magnum. Made from Grand cru Chardonnay grapes exclusively from the Côte des Blancs (66%) and the northern slope of the Montagne de Reims (34%). This is an elegant and powerful Champagne with nice fruit, hints of peach and pear, good minerality and a touch of toast. Meursault-Charmes Premire Cru- Les Charmes Dessus 2007 Domaine Antonin Guyon 100% Chardonnay Meursault is one of the villages in the southern part of the Côte de Beaune. They have a 69-acre plot here. The soil is white marl and the vines are over 30 years old. In 2007 a sunny September allowed the grapes to ripen well and the harvest to take place under excellent conditions. Sorting of the grapes takes place at the winery. Fermentation is at low temperatures in oak barrels with stirring twice a week. The wine is aged in oak barrels 1/3 new and bottled after 15 months. Meursault – Genevrieres Premier Cru 2000 Domaine Latour Giraurd A Premier Cru vineyard of the Meursault appellation in the Côte de Beaune. It is a large vineyard located in the southern end of the commune. They have 10 hectares. The vineyard is divided into halves- Genevrieres above and Genevrieses below. The upper section has better drainage and more morning sunlight and therefore produces better fruit. Free run juice and wild natural yeast is used and the wine is kept on the lees for a long period of time with racking kept to a minimum. There is no fining or filtration. The wine is fermented and aged in barrels about 1/3, which are new between 14/16 months. I believe the wine is bottled by hand. 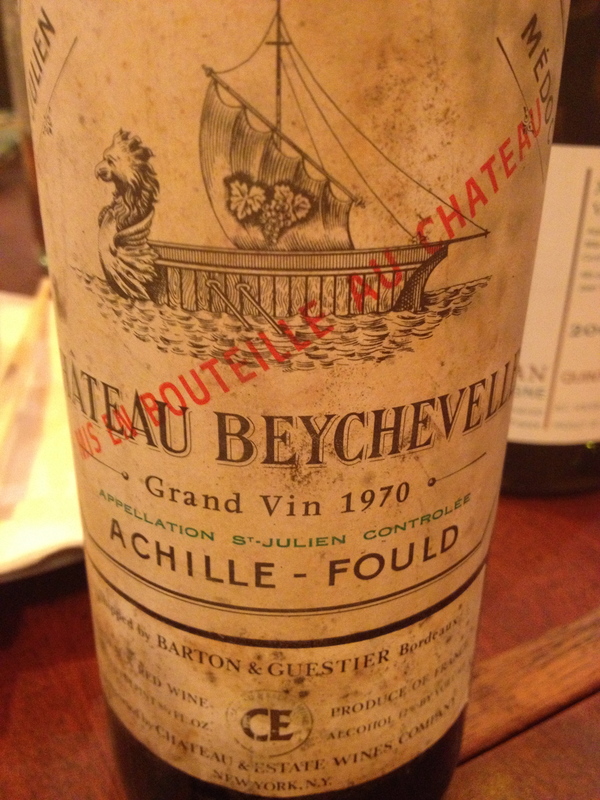 Chateau Beychevelle 1970 St. Julien 72% Cabernet Sauvignon, 25% Merlot, 2% Cabernet Franc and 1% Petit Verdot. Aged for 20 months in barriques, 1/2 new. This is what Robert Parker says about the 1970 in his book Bordeaux. “Fully mature with a spicy, plum-like bouquet, and some caramel aromas…round fruity, quiet silky and soft and nicely concentrated. It lacks the complexity and depth of the best 1970’s, but it is still quite attractive. Drink over the next 3-4 years”. He last tasted the wine in 9/84 and gives it an 84 rating. I agree with Parker in his description of the wine except for the caramel aromas. I do not agree with his rating. Almost 30 years later the wine is showing extremely well. 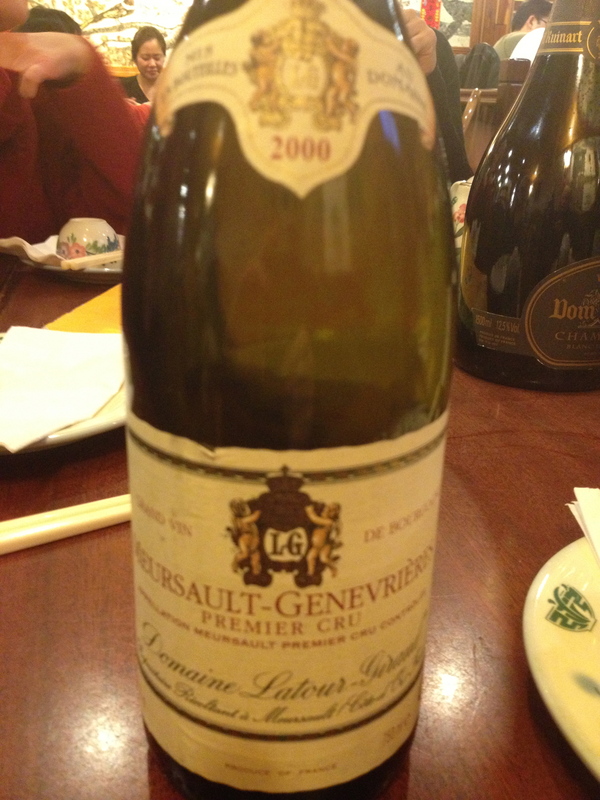 It is an elegant wine, complex, has depth and will last for a number of years. 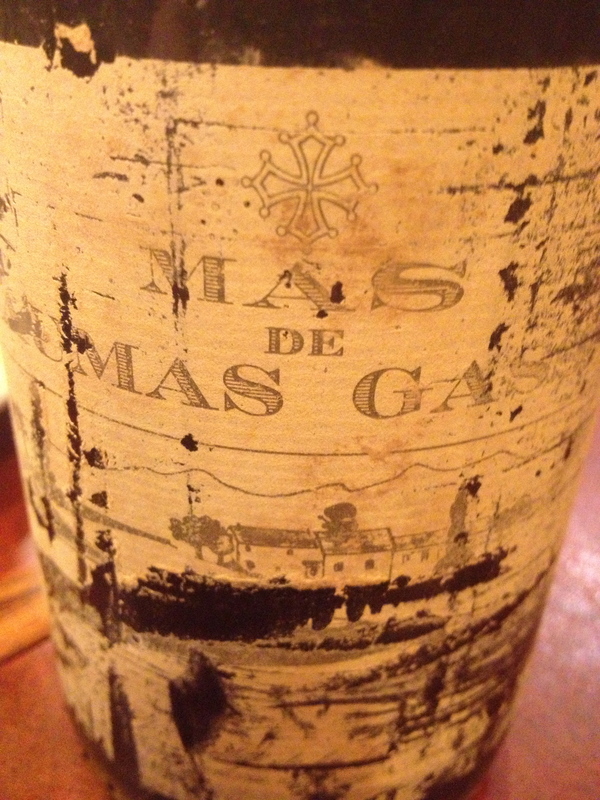 Mas Daumas Gassac 1990 Vin de Pays l’Hèrault Languedoc. Aimé Guilbert. Made from 80% Cabernet Sauvignon and 20 different varieties. The winery is located in the Gassac Valley. A rare and still unexplained, red, fine glacial soil dominates the valley. The grapes are hand harvested. Long fermentation and maceration, a minimum of 20 days, in stainless steel tanks and no filtration. The wine spends about 16 months in oak barrels, with a maximum of 10% new. This is a big, powerful wine that I first discovered with the 1983 vintage and have been drinking ever since. There were two dessert wines, a Madeira Barbeito Sercial 1978 and a 1923 Sauterne I could not read the name of the producer. The Madeira was showing very well.